The distressed black is rubbed through to reveal subtle dark cherry tones. Pewter hardware and bead board faux doors give this a charming look that's perfect for dens, offices, ski lodges, and lake or hunting cabins. 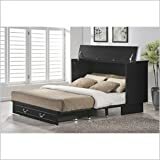 The Creden-ZzZ Style Cabinet bed comes with a tri-fold, memory foam mattress. This is a 6 - inch mattress with 4 inches of base foam and two inches of memory foam. Three mattress segments are sewn together and do not separate when laid flat. Mattress accordion folds to fit into the cabinet.